Hello there Doodlebugs! 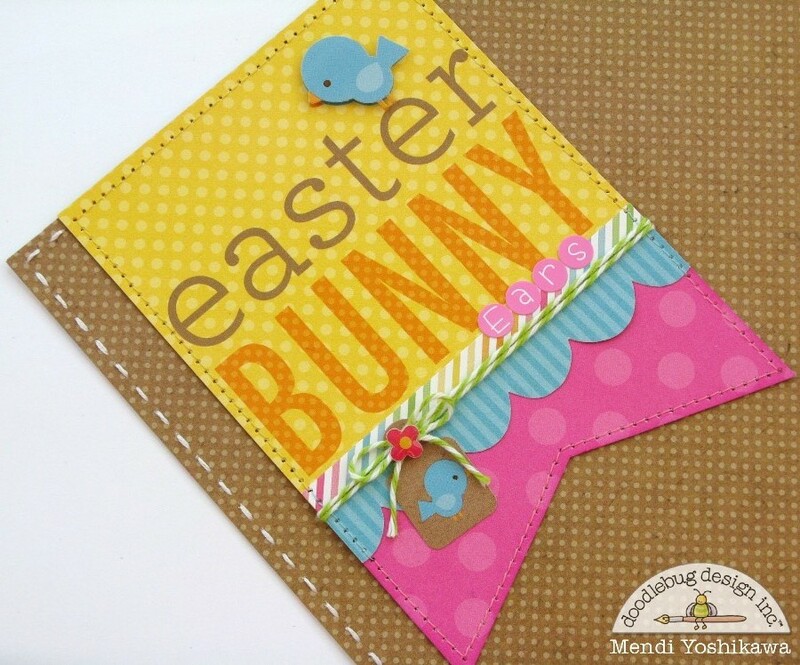 It's Mendi here and today I have a couple projects to share using Doodlebug's newest Easter Parade collection! The prints in this line are so sweet and I just love how the fun, bright colors pop against the kraft paper. I chose to mix in a few of the tone-on-tone prints from the coordinating Hello Sunshine collection and I just love how they were made to match each other! To form my title block, I cut down one of the 4x4 squares from the bunny & friends paper and added a pennant shape to the bottom. I'm giddy when the icon stickers are the same size as the images in the paper--This was the case with the darling little bird sticker which I was able to pop up with foam tape over the same image on the paper. To create my daddy and daughter bunny pair, I used a cutout from the Bunny & Friends craft kit and paired it with a smaller bunny from the Easter Parade Icon Stickers. I finished off my little scene with a kite from last year's Mini Kite Craft Kit. 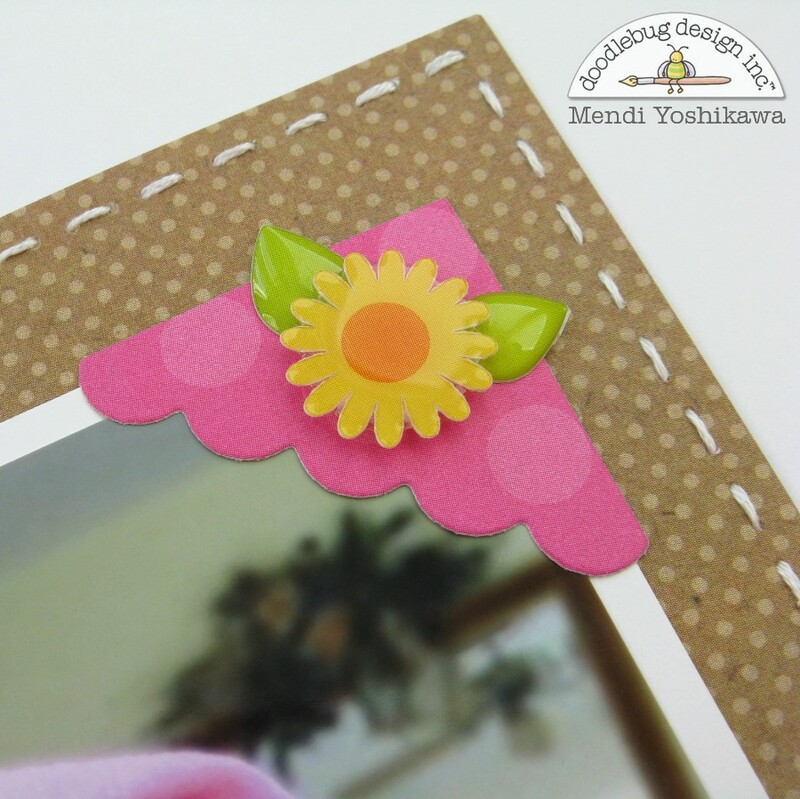 My top right hand corner was feeling a little bit empty to me so I decided to die-cut a small photo corner from some of the patterned paper and top it with one of the darling flower sprinkles. I also felt like my layout could use a border of some kind so using my paper piercer and a ruler, I stitched a small running stitch around the perimeter of my page. When I was done I still had a handful of unused (or half circles) circles so rather than throw them away I put them to good use on a quick little Easter card. 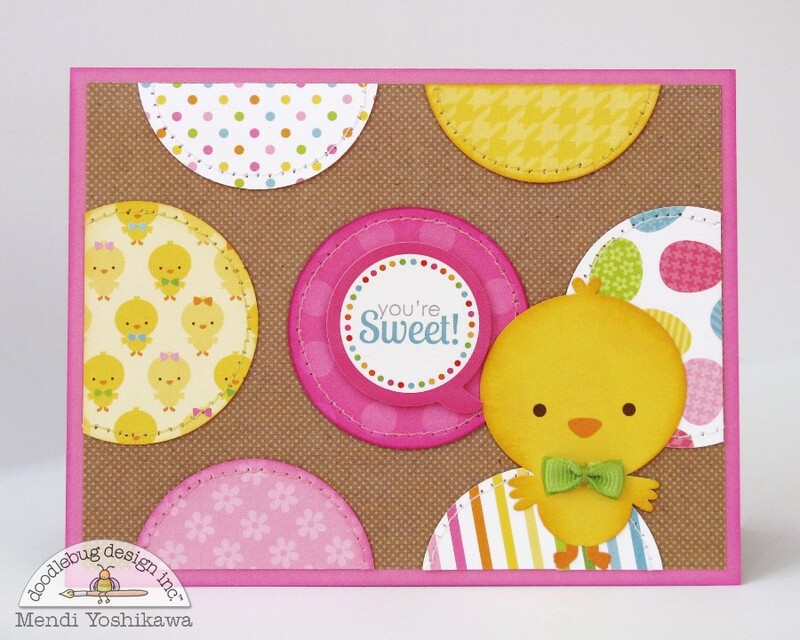 For my sentiment, I borrowed a Quotes cardstock sticker from the Take Note Collection, pairing it with the darling chick from that same Craft Kit. To give my card a fun detail, I decided to create a mini bow from my little guy using some thread wrapped around the center of some folded ribbon. 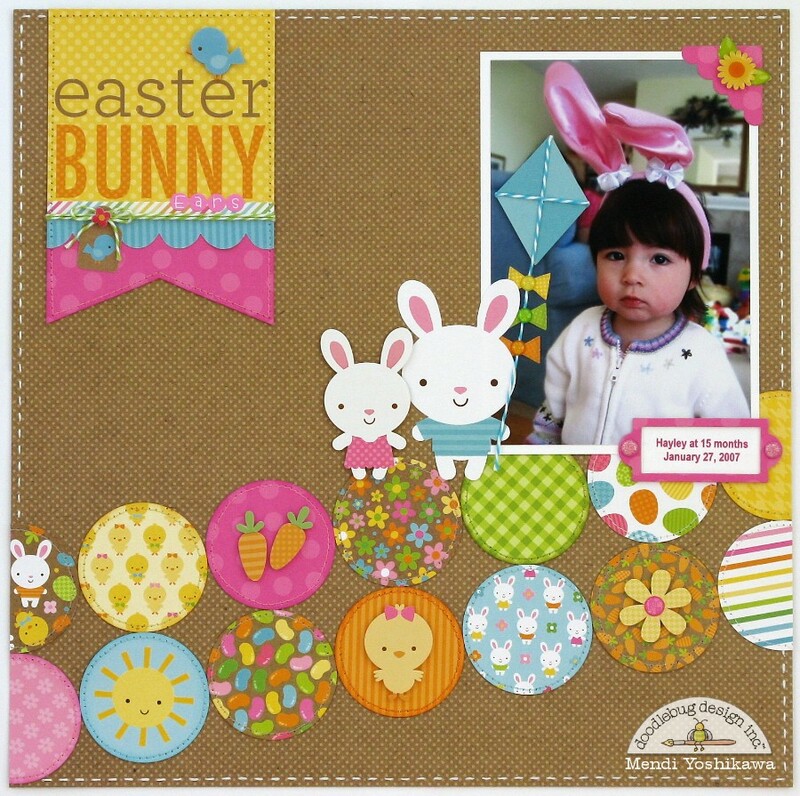 This collection is so much fun for Easter projects and with all of it's classic Doodlebug colors, it matches with so many of their other fun lines! Adorable projects Mendi!!! I LOVE her sweet little face! The picture is awesome, and your Lo incredible, really love it!!! 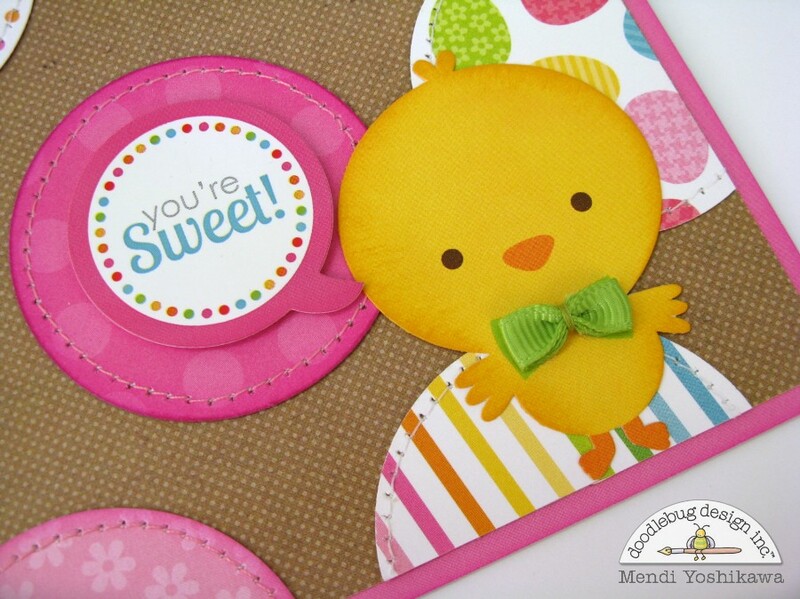 LOVE your layout & card Mendi!!! OMG Haley is one super beautiful little girl and looks so precious in her bunny ears. 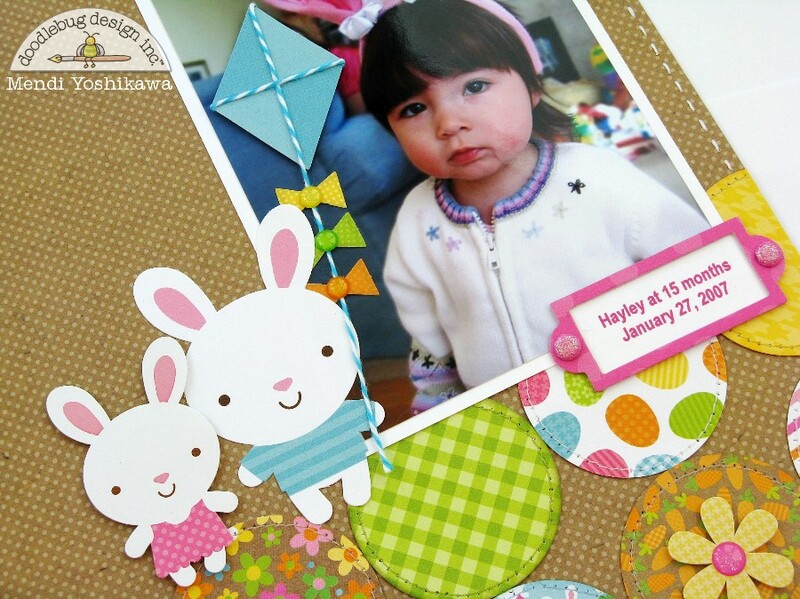 Your layout is just so cute and love the papers you chose and your clever and creative embellishment ideas YOU ROCK!! I LOVE THIS!!! Mendi is a rock star when it comes to stitching - what a fantastic and precise, clever crafter she is!!! This layout shows that she is at the top of her game and this is a huge hit with me!!! Those circles and the pink scalloped corner - amazing!!! !